Read on for information about Legacy Mode and some other tidbits! As Sal's Realm is made up of many different nationalities, it's no surprise that things are getting a little bit rowdy on the World Cup topic. Discuss the World Cup, slam other peoples' usage of the term "soccer," and post your favorite Suarez memes. The World Cup ends July 12th. Are you one of those people who firmly believes that Elvis and Jim Morrison are not dead but actually just sharing a few beers out in some lonely bar in Montana? Then we have a good topic for you: the God of Balance and Nature, Guthix topic. In it, new forumer LordPalmulehto provides his reasoning to why Guthix is still alive. Do you believe the conspiracy theory? Or are you unimaginative? After a six month battle and a site poll, the pro-font change group has finally won. Earlier this month, Sal changed the font that many users found hard to read to "Open Serif" for the text and "Droid Serif" for the headers. In fact, you should be reading the new font right now (assuming you haven't hacked the site and are reading the code). The change has received positive reviews and makes it easier for some users to read our guides and other materials. We apologize for the forum outage on June 29th. The person responsible for this has been fed to the King Black Dragon. Considering many of our forum users are retired players who quit RuneScape before EOC, we thought we would dive into Legacy mode, which is (depending on how you look at it) either a way to enjoy the RuneScape you were used to before the Evolution of Combat update OR a desperate attempt to get you guys back into the game. There is currently a vote out to bring Legacy back, and the option to bring Legacy back is winning 79% to 20%, so expect a Legacy mode to be in the game with an ETA of installment this month. As stated by Jagex, Legacy mode is not completely the pre-EOC RuneScape, but an intermediate between the pre-EOC RuneScape and the EOC RuneScape. Some aspects, such as the no ability combat system, are coming back, while others, such as 100% protection prayers, are not. However, playing Legacy will be the closest thing to pre-EOC you can get. Strength bonus, special attacks, and a max hitpoint value of 990 wearing no armour will be reinstated. For both combat systems, lifepoints will be based on your constitution (hitpoints) level and not the armor you have on. This should make constitution level more important again. Critical chance will be done away with and be replaced with strength bonus (which is similar to the strength bonus before EOC). Also, during the EOC update a few items had their requirements changed. For example, Rune was changed from level 40 defence to level 50 defence. This will be reverted back to 40 defence to appease Rune Pures who could no longer equip rune. With Legacy comes more than just the old combat style. Several things will look similar as well. Most notably, you will get an old interface similar to the one before EOC. You can also select a fixed interface similar to the pre-EOC interface. A few other looks are back into play. Several old animations, such as the whip animation and the walking animation, are back in the game in Legacy mode. Prayers and a few armor sets also more closely resemble their old selves. 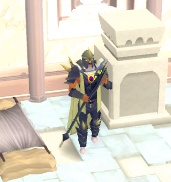 The Legacy Dharok's set closely resembles the one from Pre-EOC. With Legacy, special attacks will be reintroduced (this goes for EOC too). In Legacy, special attacks will not be done using adrenaline but by using the special attack bar as before. This means you won't have to worry about getting adrenaline up or keeping adrenaline up like you do in the EOC. Newer weapons, such as the drygore weaponry, that came out after the Evolution of Combat update do not have special attacks, although this could be subject to change. Special attack damage will scale with strength, so special attacks should be able to hit for most weapons. 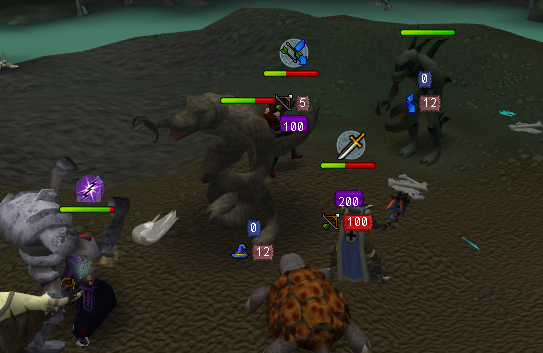 The godswords, particularly Armadyl, have a very powerful special attack. Although they were somewhat nerfed recently, the Armadyl godsword special can hit into the 700s. This will be very useful for KOing players and monsters that heal. The Bandos Godsword has another useful special attack. 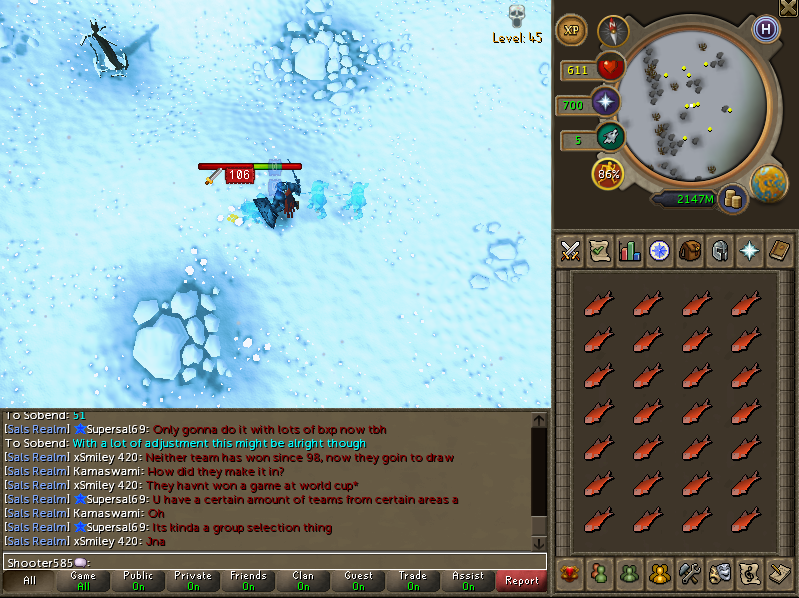 It hits about 100-150 hit points lower than the Armadyl Godsword special but reduces defence by quite a bit. The Bandos Godsword is also much easier to obtain and is cheaper than the Armadyl Godsword, which will be helpful with those with little money to spend. The other Godswords keep their special attacks (Zamorak freezes the opponent, Saradomin heals you). As for other melee special attacks, the Korasi's sword is strong once again after a recent buff. It is a magical based attack (similar to before) and can hit into the 500s. Dragon Claws are useful but not as good as they once were due to the fact that they are only level 60 weapons and because they are dual wielding (it takes two clicks to switch to dragon claws now instead of one; this makes quick switching tough). Dragon daggers have similar accuracy to claws and thus aren't terribly useful. Onto ranged special attacks. Ranged has a very useful special attack weapon with the dark bow. The dark bow fires two powerful ranged shots, which can each hit into the 500s. They are also very cheap when compared to the other special attack weapons. A dark bow usually can be bought for under 100k. Other special attacks are not as useful. The Magic Shortbow is a tier 50 weapon and is not useful for higher leveled players.The hand cannon, which once had a useful special attack, now has a weak special attack despite being equally tiered with the Godswords as a tier 75 weapon. Do not be surprised if a buff comes to the hand cannon. Magic, which was never known for its special attacks, has the weakest special attacks out of all the combat classes. The strongest is likely the Armadyl Battlestaff, which hits with one strong hit followed by two weaker hits. As the god spells have been removed (they all have been replaced by a singe spell named Divine Storm), each god staff has a special attack based upon its prior god spell. The Iban Staff has a similar fate. Farcasting (mentioned in the PvP section) will make up for the lack of special attacks. Many of the biggest supporters of Legacy are ex-PKers, so they are likely going to want to know how Legacy is. PvP in Legacy is very similar to pre-EOC PvP as there are no abilities and special attacks are back. A few new things have come into play, however, these being new armours (tier 85 and tier 90), new weapons (some tier 85 and tier 90), and dual wielding (which is equipping two one handed weapons). Do not expect new weapons and dual wielding to make a significant impact. Although accurate, the one handed nature of these weapons makes them weak and bad for KOing. They are also expensive and do not have a special attack. However, when the t90 2h weapons come into the game, expect them to be used frequently. The new armours will be useful, but are also a tad expensive. Do not expect these armours to be used widespread, although some with the money to spend will certainly be using these. As there are no escape stun methods in Legacy, expect a mage's best weapon to be farcasting. Ice blitz/barrage will be the most commonly used magic spell, with bind being used for freeplay. Mages are also going to be a force in freeplay now they have equivalent armors and weapons to melee and range. Another interesting thing about the combat updates is that lifepoints comes from constitution level and not armour. As the biggest issue for one defence pures right now is their lack of lifepoints, this update has greatly benefited pures. And of course, as stated earlier, pieces of equipment pures were able to equip before the EOC update (mithril RFD gloves, iron armour) will now be equipable once again. Expect pures to be back in number now that they don't have they don't have to worry about getting KOed at full health. Expect PKers to be mainly using spec weapons (see the special attack section) at first and tier 90 2h weapons later on. The update should help clanning as DPS is lower and there is no enter to talk, which should help pile calls. It's tough to say how large scale clanning will act right now, considering it has not been tested by anyone in Legacy. Dharoks is not as useful as it used to be, with max hits in the 600s and 700s as opposed to the 900s and beyond in pre-EOC. Players using more up-to-date gear will also be able to shred through the Dharok's tier 70 armour. Protection prayers now protect against 50% of the damage in PvP, as opposed to 25% in EOC. There will be Legacy mode only worlds, which will be useful for PKing. If you are not in a Legacy only world, you may have to face someone using EOC. Most of the playing community today is PvM oriented and may be wondering how Legacy works with PvM. Strangely enough, many monsters are weaker in Legacy than they were in pre-EOC. For example, the Blue Dragon was once around level 110 pre-EOC but is now level 78. This applies for many more monsters, but most boss or demi-boss monsters (such as Glacors) are not as affected by this. In general, the DPS in Legacy mode is lower than the DPS in EOC, so if you want to be as efficient as possible you should still use EOC. You will also not be able to use healing abilities, freedom abilities, and most other abilities. However, in Legacy you will not need to press down on abilities. If you had a long day of school and want some laid-back PvM, perhaps Legacy mode is the thing for you. Legacy mode will be particularly useful for monsters that require you to change combat classes as you only have to change gear, not gear and ability bars. So expect Legacy to be useful with Tormented Demons, Akrisae, and in certain quest fights. Onto the specific monsters. All monsters discussed were tested using tier 90 weapons and tier 80 or above armour. Monsters normally fought in teams were fought with three players, each using a different combat style. Dagannoth Kings are a fair bit harder in Legacy mode than the EOC mode. Their offensive ability was the thing most impressive. Little strategy was used here, however. In a note unrelated to Legacy or EOC, you can now access the Dagannoth Kings without the aid of another person. Three members of the Sal's Realm clan fight the Dagannoth Kings. Nex is very difficult in Legacy. Whereas the test team easily would have beaten one or two Nexes in EOC in the trip, the team was stalled at the Blood Phase, allowing Nex to heal back to full hitpoints. It is strongly recommended to fight Nex in EOC. Other bosses in the GWD were not fought because of time wasted getting kill count. 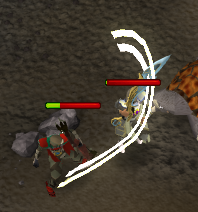 The Kalphite Queen can be nice to fight in Legacy as you do not need to change ability bars. Nevertheless, this boss is not frequently fought due to lack of decent drops. The Kalphite King, a boss released after the Evolution of Combat update, was surprisingly not difficult in Legacy. The boss has a lot of hitpoints but not too much offensive ability. One with KK experience may ask, "How can you kill the Kalphite King in Legacy mode if you have to use the 'provoke' ability?" The answer is that each shield that is tier 80 or higher comes with a provoke option, allowing the Kalphite King to be killed. 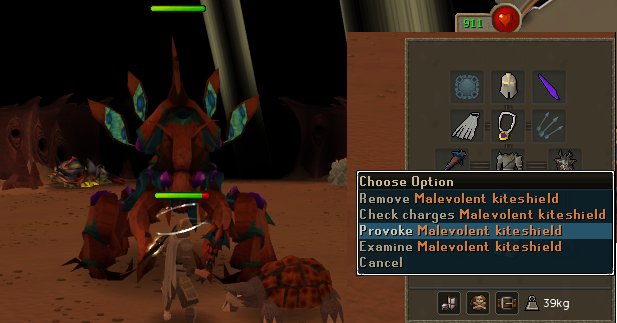 The provoke option on shields will be particularly useful for the Kalphite King. Legacy will be useful for normal barrows (Barrows hard mode, or Rise of the Six, was not done due to lacking a fourth player) if you are fighting Akrisae due to the annoyance of ability bar switching. If you are not fighting Akrisae, you are better off using EOC. All other bosses that were tested (Giant Mole, QBD, etc.) follow the guideline of EOC is faster, but Legacy is more relaxed. The combat triangle has been slightly relaxed. Your armour and weapon still need to be of the same class, otherwise you will face an accuracy decrease. Sadly, you won't be able to use dragonhides and a whip effectively again. Enhanced Excalibur, which is now an off-hand weapon, has retained its old special attack which can be accessed using the "operate" option when it is wielded. Saradomin Brews have been buffed across both EOC and Legacy. EOC will be more cost efficient than Legacy because abilities do not use up arrows/runes. If you want to barrage or burst, Legacy will provide much better experience gains. Legacy barraging in the abyss provides the best magic experiences gains per hour in the game. How close is Legacy to Pre-EOC RuneScape? As an author, I have no idea. I lost membership in December 2006 and didn't regain it until June 2013, when EOC was already implemented. I have watched a few pre-EOC PK videos to familiarize myself with pre-EOC, but I never played it in members. This is something you will have to decide. If you have any questions, post in the announcement topic, the RuneScape questions subforum, or just PM me (Sobend) on the forums. On July 1, 2013, the Sal's Realm staff put together the first Santafish Monthly. Since then, the ranked members, with the help of a few non-ranked members, have put together a newsletter for each month (except October 2013). We would use the word... gratifying to describe the past year. If you would like to view the first newsletter, click here. If you would like to see the entire collection of Santafish Monthlies, here.